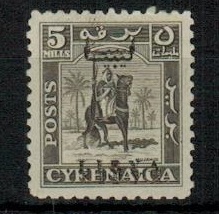 Showing items in category Cyrenaica Emirate, sorted by newest listed first. 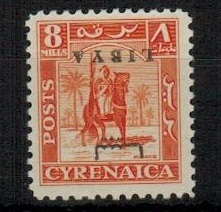 CYRENAICA EMIRATE - 1951 registered 27m rate local cover used at EL MARJ/2. 1951 (FEB.3.) 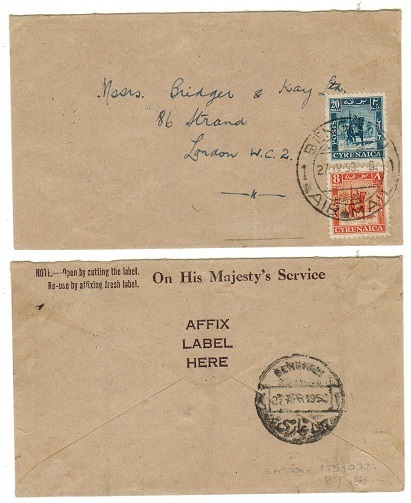 registered cover addressed locally in Arabic bearing 'warrior' 3m pair and 8m strip of three tied by EL MARJ 2 cds's (GBOS type C6) with blue on cream 'R/694' label at top right similarly struck. A rare registered use of these stamps at El Marj. The basic internal letter rate being 10m and 20m registration fee paid. 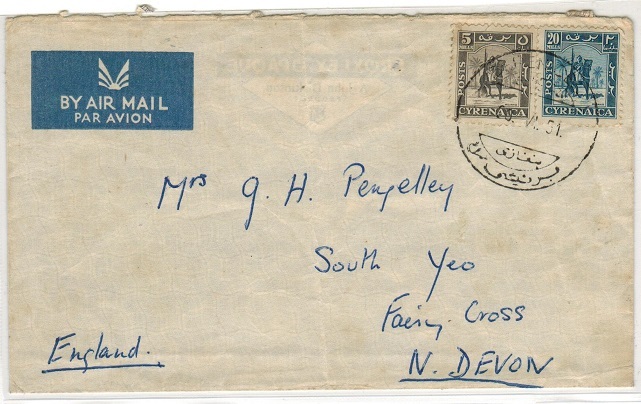 CYRENAICA EMIRATE - 1950 28m rate cover to UK used at EL MARJ/2. 1950 (JUN.22.) cover addressed to UK bearing 'warrior' 4m and 8m (x3) adhesives tied by EL MARJ/2 cds (GBOS type C6). The reverse shows the very rare BENGHAZI (Arabic) cancel (GBOS type BC7) used as a transit mark. CYRENAICA EMIRATE - 1951 30m rate 'Ex POW' worker cover to Germany used at BENGHAZI 1. 1951 (JAN.18.) 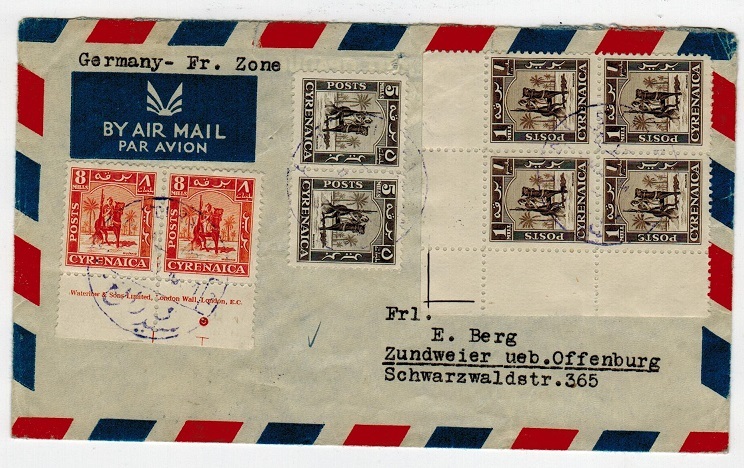 airmail cover addressed to Germany bearing 2m,4m (x2), 8m and 12m adhesives (SG 137,139,141+143) tied by BENGHAZI/AIRMAIL cds's. Marked 'German/British Zone' and with BENGHAZI/1 transit b/s. 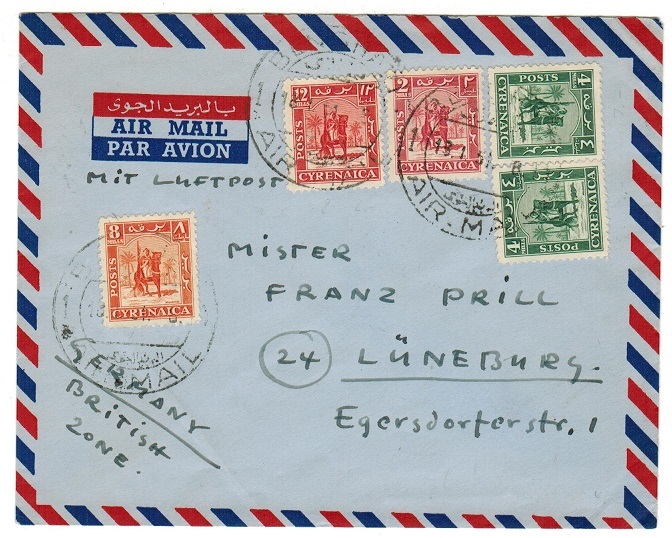 A 30mils postage rate cover from Ex POW worker to Germany. 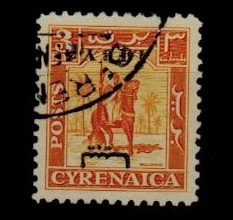 CYRENAICA EMIRATE - 1950 28m rate cover to Malta used at DERNA 2. 1950 (13.VII.) 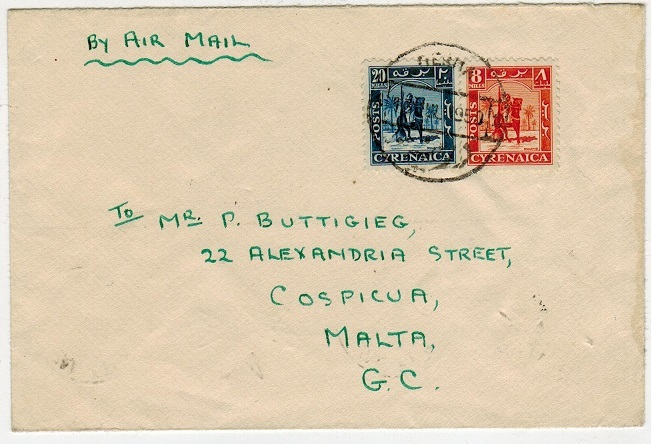 cover addressed to Malta bearing the 'warrior' 8m and 20m adhesives tied by DERNA 2 cds (GBOS type C3). A scarce village use of these stamps on external mail. 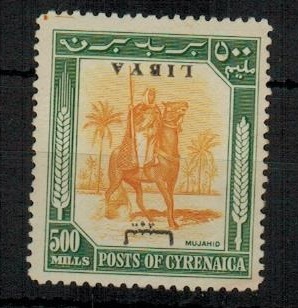 CYRENAICA EMIRATE - 1950 first day FRONT with 'Mounted Warrior' and 'Postage Due' sets. 1950 (16.JAN.) first day use of the 'Mounted Warrior' series of 13 (SG 136-148) together with the rare 'Postage Due' series (SG D149-D155) on manila piece cancelled by scarce SHAHAIT/CYRENAICA cds's. A rare use of these stamps on the first day of issue. 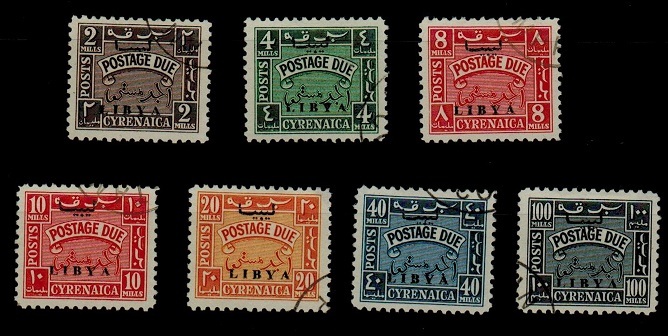 CYRENAICA EMIRATE - 1951 'Mounted Warrior' set of 13 on piece used on First Day at BENGHAZI. 1951 'Mounted Warrior' series of 13 values on large piece each cancelled by BENGHAZI/AIR MAIL cds's used on the first day of issue (24.DEC.1951). 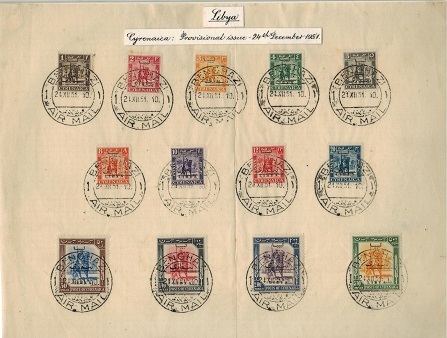 Scarce stamps used on the first day. SG 131-43. 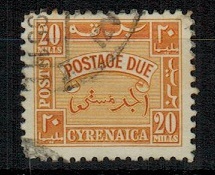 CYRENAICA EMIRATE - 1950 20m orange yellow 'Postage Due' used. SG D153. 1950 20m orange yellow 'Postage Due' fine used. SG D153. 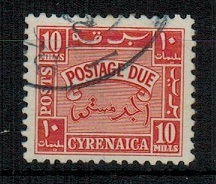 CYRENAICA EMIRATE - 1950 10m orange 'Postage Due' used. SG D152. 1950 10m orange 'Postage Due' fine used. SG D152. 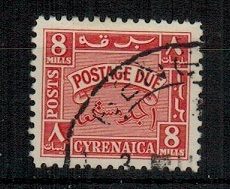 CYRENAICA EMIRATE - 1950 8m scarlet 'Postage Due' used. SG D151. 1950 8m scarlet 'Postage Due' fine used. SG D151. 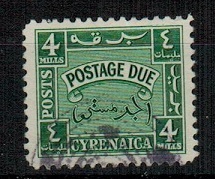 CYRENAICA EMIRATE - 1950 4m green 'Postage Due' used. SG D150. 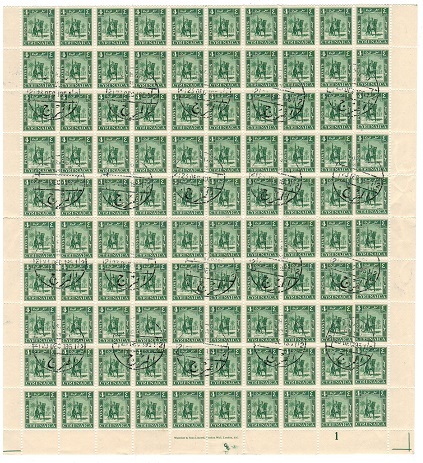 1950 4m green 'Postage Due' fine used. SG D150. 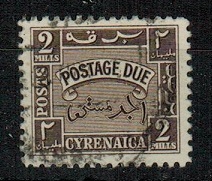 CYRENAICA EMIRATE - 1950 2m brown 'Postage Due' used. SG D149. 1950 2m brown 'Postage Due' fine used. SG D149. 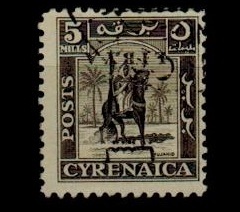 CYRENAICA EMIRATE - 1950 'Mounted Warrior' set of 13 fine mint. SG 136-148. 1950 'Mounted Warrior' series of 13 in fine lightly mounted mint condition. SG 136-148. 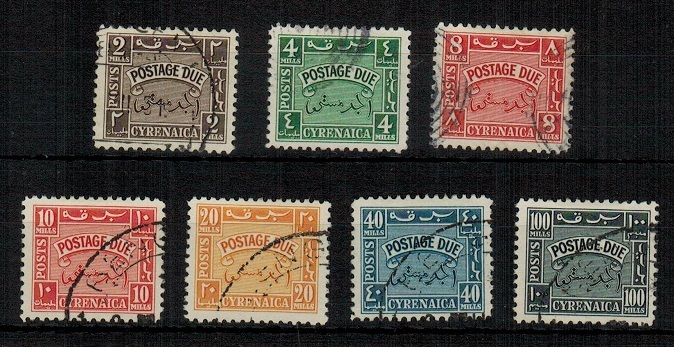 CYRENAICA EMIRATE - 1950 'Mounted warrior' set of 13 fine used. SG 136-148. 1950 'Mounted Warrior' series of 13 in fine used condition. SG 136-148. 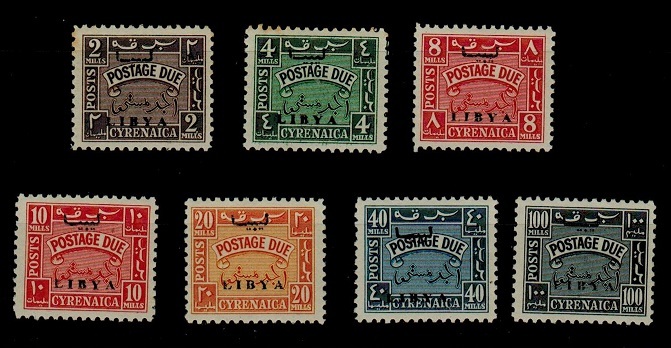 CYRENAICA EMIRATE - 1950 'Postage Due' set of seven unmounted mint. SG D149-D155. 1950 'Postage Due' series of seven in fine unmounted mint condition. Complete with PHOTOGRAPHIC PROOF without value tablets. SG D149-D155. 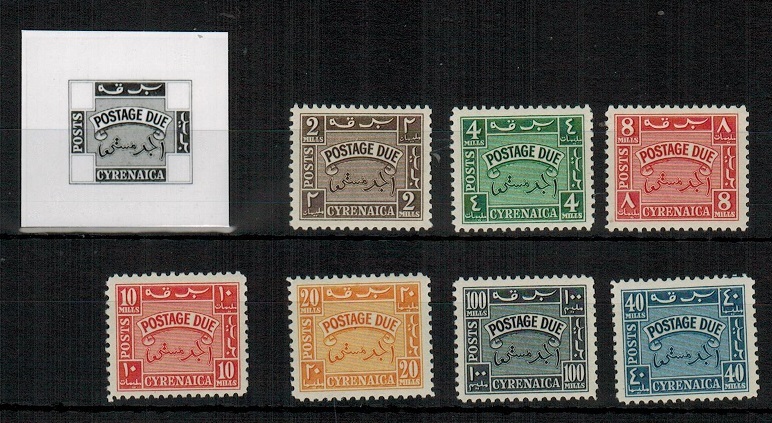 CYRENAICA EMIRATE - 1950 'Postage Due' set of seven fine used. SG D149-155. 1950 'Postage Due' series of seven in fine used condition. A very rare set. SG D149-155. 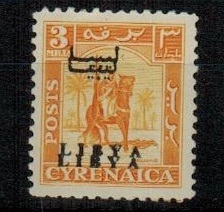 CYRENAICA EMIRATE - 1950 28m rate cover to UK used at BENGHAZI. 1950 (27.IV.) 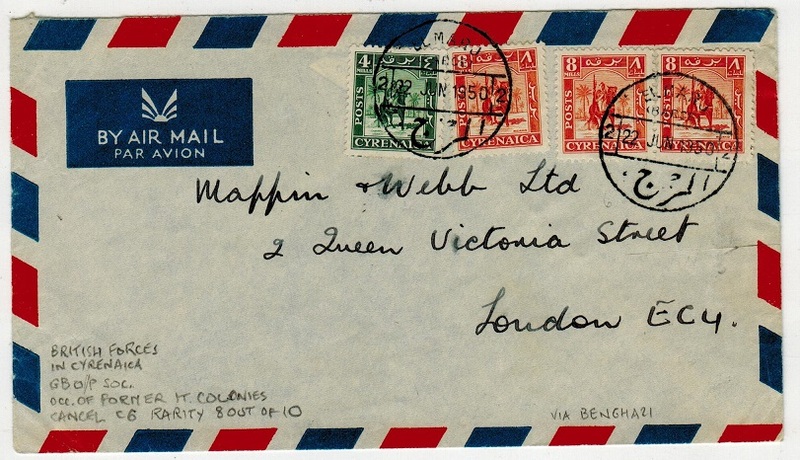 cover addressed to UK bearing 8m and 20m adhesives (SG 141+144) tied by BENGHAZI/AIR MAIL cds. These stamps are scarce on cover having a very short life. 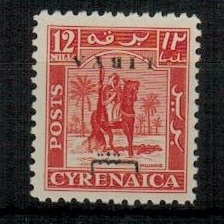 CYRENAICA EMIRATE - 1951 25m rate cover to UK used at BERENICE. 1951 (20.VI.) cover addressed to UK (central fold and lightly aged) bearing 5m and 20m 'warrior' adhesives tied by BERENICE No.1/BENGHAZI cds (GBOS type BC10) with BENGHAZI transit b/s. These stamps are scarce on cover having a very short life. The Berenice sub office cancels are rare. 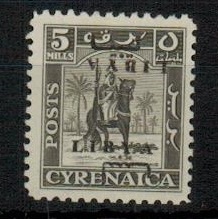 CYRENAICA EMIRATE - 1950 10m rate local cover. 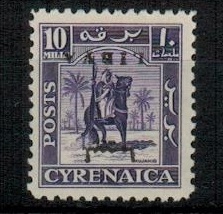 1950 locally addressed military cover bearing 10m violet (SG 142) tied by TOBRUK/CYRENAICA cds. 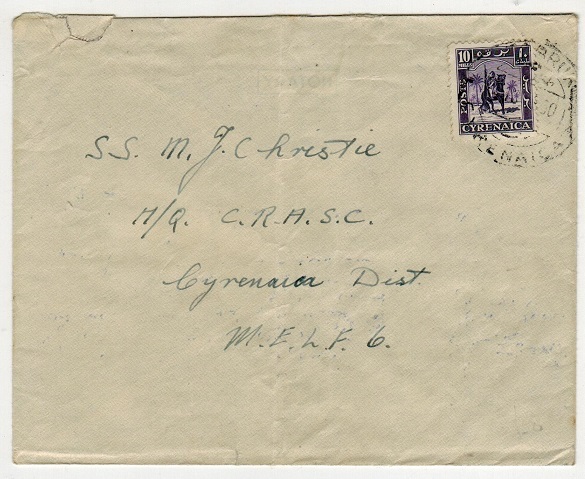 CYRENAICA EMIRATE - 1951 cover addressed to Holland used at Benghazi. 1951 (13.VI.) 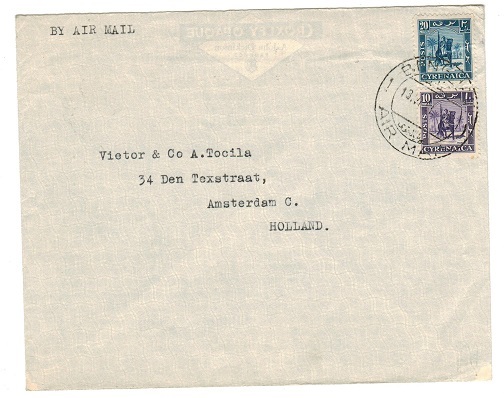 cover addressed to Holland bearing 10m and 20m adhesives (SG 142+144) tied by BENGHAZI/AIR MAIL cds. These stamps had a very limited use prior to their independence in 1951. 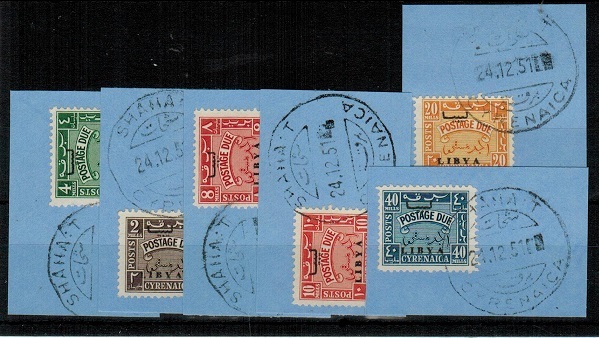 CYRENAICA EMIRATE - 1950 4m block of 100 cancelled EL MARJ/2. SG 139. 1950 4m blue-green 'warrior' adhesive in a fine orinal sheet of 100 (ex top margin) showing PLATE 1 and 'WATERLOW & SONS LIMITED' imprint in bottom margin cancelled to order by scarcer EL MARJ/2 cds's dated 25.DEC.1951. The top row and the bottom row have eluded the cancellator. Unusual and scarce piece. SG 139. 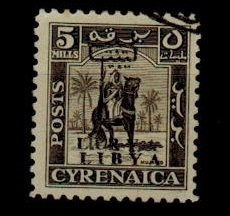 CYRENAICA EMIRATE - 1951 15m rate cover to UK used at BENGHAZI. 1951 (NOV.26.) 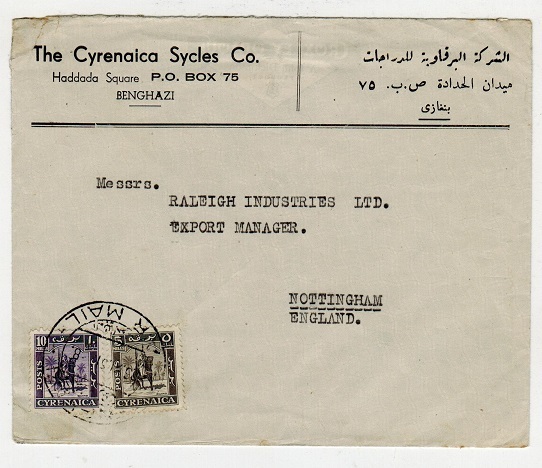 commercial 'The Cyrenaica Sycles Co' envelope addressed to UK bearing 5m and 10m adhesives (SG 140+142) tied by BENGHAZI/AIRMAIL cds's. 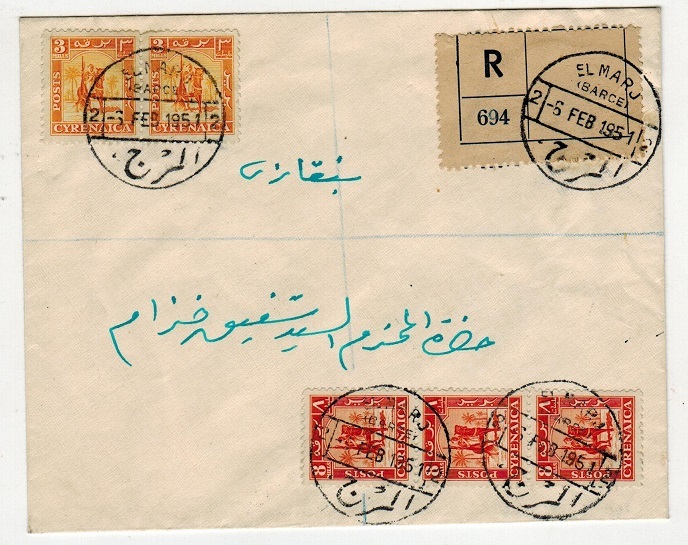 CYRENAICA EMIRATE - 1951 cover to Germany used at SIDI RAFA 2 with cds in 'violet' ink. 1951 (29.5.) cover addressed to Germany bearing 'warrior' 1m block of four plus 5m and 8m pairs tied by SIDI RAFA 2 cds's in violet ink (GBOS type C12). These stamps had a very short life and village uses are very scarce. 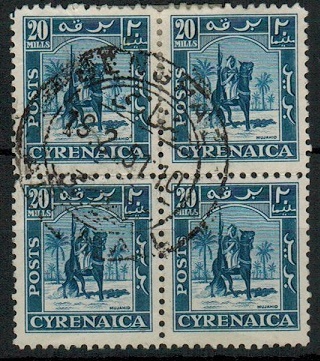 CYRENAICA EMIRATE - 1950 20m block of four used. SG 144. 1950 20m blue 'warrior' adhesive (SG 144) in a fine block of four with central BENGHAZI cds dated 19.2.51.